In your business or rental property, one of the most devastating incidents that can occur is a fire; but when was the last time you checked your fire doors? 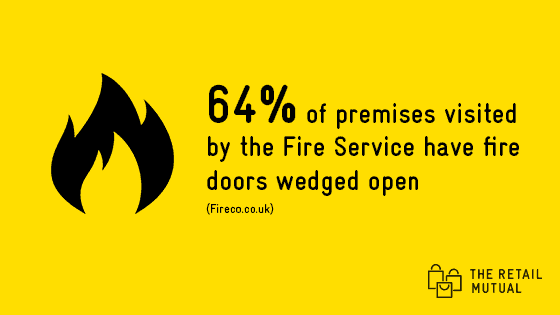 Fire doors are designed to save lives. The materials used to make them can withstand an incredible heat temperature for at least 30 minutes. A fire door’s function is to prevent the spread of fire and smoke so that people can evacuate safely and make the fire easier to tackle. If a door is damaged or propped open it will not fulfil this function. Fire doors are clearly marked or labelled to remind users to keep them closed. But there may be times when this is inconvenient, for instance if they restrict wheelchair access, are heavy to open or make a room hot and stuffy. What sometimes happens in these situations? The door gets wedged or propped open. If you see a fire door that it is held open, you should make sure the obstruction is removed so the door stays closed. It is also important to make sure that the fire door in your building or shop is the right specification, installed correctly and well maintained. There is a simple 5 step check that you can do. If you operate your shop from rented premises, if you think the door is faulty, don’t ignore it. Report it to whoever manages the building. For more advice on fire door safety for your shop, visit www.firedoorsafetyweek.co.uk. Imagine this: the unfortunate incident has occurred, and a fire has broken out. What does this mean for insurance? Well, you hope that you are covered. But in the event of a fire, if the door has been wedged or propped open your insurer may refuse your claim. What type of insurance should I have for my business? There is no specific cover for fire damage but there are several types of insurance which could cover the cost of repair or replacement in the event of a fire. Stock and contents insurance is one such example; for many retailers your stock is one of your most valuable assets and in the event of a fire you will want to be able to recover the cost of what has been lost. As an independent business owner, you may want to consider business interruption insurance. Keeping your business afloat during a claim can be a challenging time. This type of cover helps with that and may cover loss of profits, staff wages and even interim payments to tide you over. If you own your shop premises, buildings insurance can protect you against fire damage. You may also want to consider including cover for your fixtures and fittings (i.e. shelving and display cabinets). The exact cover for your retail business may vary from provider to provider so It’s important to check your cover documents to know what is and is not covered. If you have any queries regarding your shop cover, or you would like a free, no-obligation quote, contact us on 0333 2121 280 or fill out our online quote form. Is my rental property covered? Residential landlord insurance can protect your building and contents in the event of a fire. The Retail Mutual’s landlord cover has fire, lightning and storm damage all included as standard. What do I do if the unexpected happens? If the unexpected does happen – don’t panic. Contact our claims team on 0333 2121 008 who will be happy to help. We are open Monday to Friday from 9.00 am to 5.00 pm or in the event of an out-of-hours emergency call 01424 850 333.